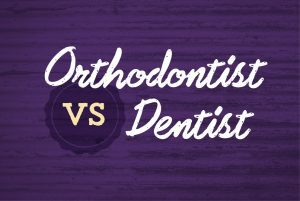 Have you ever wondered what the difference is between orthodontists and dentists? Orthodontists, like Drs. Birth, Stewart & Fletcher, are both similar and different from dentists. First of all, orthodontists and dentists are both concerned about your teeth and oral hygiene. Also, dentists and orthodontists are required to go to a dental school to complete their training. However, there are also several differences between orthodontists and dentists. Orthodontists focus on the overall alignment of your facial structure and teeth. They are more concerned about how the bones in your face and jaw affect your overall health. Orthodontists are trained to know how to best move and alter your facial structure in order to help concerns like TMJ, headaches, and the alignment of your teeth to avoid chipping and tooth wear-down. Dentists, on the other hand, are trained to focus on the health of your teeth specifically. They usually treat things like cavities, root canals, and other tooth-related issues. In addition, orthodontists are required to attend school past dental school to receive their specialty training. This typically lasts about two years. Dr. Birth and Dr. Fletcher have even gone a step past this to earn their Board Certification with the American Board of Orthodontics that involves rigorous testing and exams. In conclusion, all orthodontists are dentists but only 6% of dentists are orthodontists. It is recommended that you see an orthodontic specialist for braces and Invisalign since the process involves altering your facial structure. Call us today for a complimentary consultation!